Sometimes, a stay-and-play on land offers more than you might expect. Caresse Bodrum, a boutique Marriott resort in Turkey, has both speedboats and superyachts for charter. Better yet, it lets you enjoy a yacht vacation like James Bond himself. Caresse Bodrum attracts attention partly for its intimate feel. It has 67 rooms and nine suites. The two-year-old resort is also in close proximity to historic sites in Bodrum, and has a private beach. For guests like you, though, Caresse Bodrum holds appeal for its seven boats and yachts for charter. The largest is El Bandido, a 105-footer (32-meter). Three staterooms accompany the master, which has a hot tub. The motoryacht herself looks like she stepped out from history, with throwback styling, even though she splashed in 2008. Then there’s another superyacht, Miss B (above). She delivers a true Turkish experience, since she’s a gulet. LOA: 95’5” (20.1 meters), with plenty of space on her foredeck for lounging at sunset. As much as these, plus a 51-foot (15.3-meter) power yacht named Incognito, let you indulge in a yacht vacation, they’re not Caresse Bodrum’s only coveted boats. To really indulge like James Bond, you need to drive a yacht like him. And you can, with one of the resort’s smallest boats, Katia. 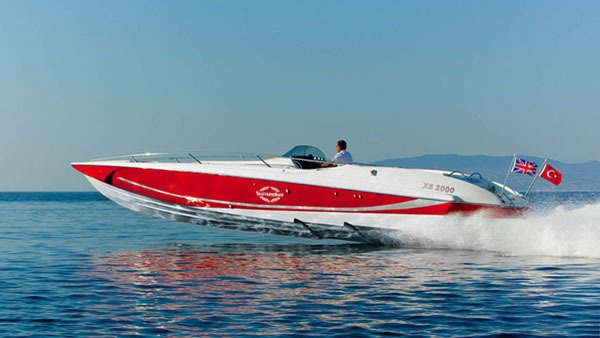 Seen above, she’s a Sunseeker XS 2000—the very same speedboat that actor Daniel Craig drove in the film Casino Royale. You might remember seeing him behind the wheel when his character arrives in the Bahamas. At 39 feet (11.81 meters), Katia lets you take your friends and family for thrill rides, since she can hit 65 knots. Of course, she also lets you explore some of the more secluded swimming spots near the resort.